이 책은 송나라 여조겸의 교편(校編)이며, 조선 태종 3년(1403)에 주조한 동활자인 계미자를 사용하여 태종년간에 간행한 것이다. 계미자는 고려와 조선시대의 글자주조술과 조판술의 발달사연구에 귀중한 자료인데 사용했던 기간이 짧아 전해지는 본이 희귀하다. 구성을 보면 권4는 2∼29장으로 구성되었으나 1장이 결락되어 28장만 남아있으며, 권5는 1∼19장 모두 현재 전하고 있다. 책의 상태를 보면 습기로 인해 표지가 퇴색했으며, 문자가 보이지 않는 곳도 있다. 책의 앞뒤의 염황색 표지를 대어 염청색의 면으로 보강하였다. 책의 크기는 가로 10.7㎝, 세로 29.7㎝이다. 계미자를 사용한 다른 유물들보다 인쇄상태가 정교하고 선명하다. 이 책은 계미자를 이용하여 간행되었다는 점과 고려, 조선시대 활자체를 연구하는데 중요한 자료로 평가되고 있다. 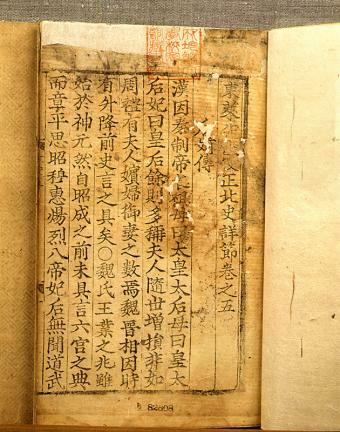 This book (10.7㎝ long and 29.7㎝ wide) was published during the reign of King Taejong (r. 1400-1418) using the country’s first copper printing types made in 1403 (3rd year of the reign of King Taejong). 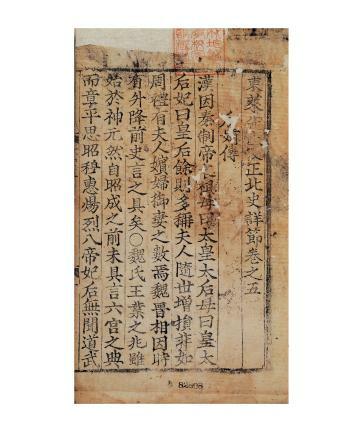 The first copper printing types (called Gyemija) are precious materials for those studying the technology for type production and setting of the Goryeo and Joseon periods. 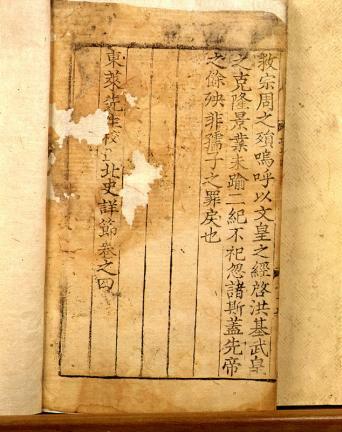 Since Gyemija was used only for a short period, there are few remaining books printed with it. One page is missing in Volume 4 (pages 2 ~ 29). No page is missing in Volume 5 (pages 1 ~ 19), however. The covers have been discolored, and some letters are illegible. The book was printed more clearly than other books printed with Gyemija. It is very valuable as one printed with the country’s first copper printing types.